My first encounter with a bee was not a happy one. I was five years old and Mom was mowing the clover-filled front lawn. I tried to step carefully in the clover, but my flipflop flipped up a honey bee that stung the side of my big toe. I was hysterical when I felt the jolt of pain, looked down and saw the bee on my toe trying to pull its stinger out. According to Mom, I wailed loudly enough to bring the neighbors outside. I didn’t care that the honey bee stung out of self-defense and that it would die. I was petrified of bees and their kin for many years and always avoided them. 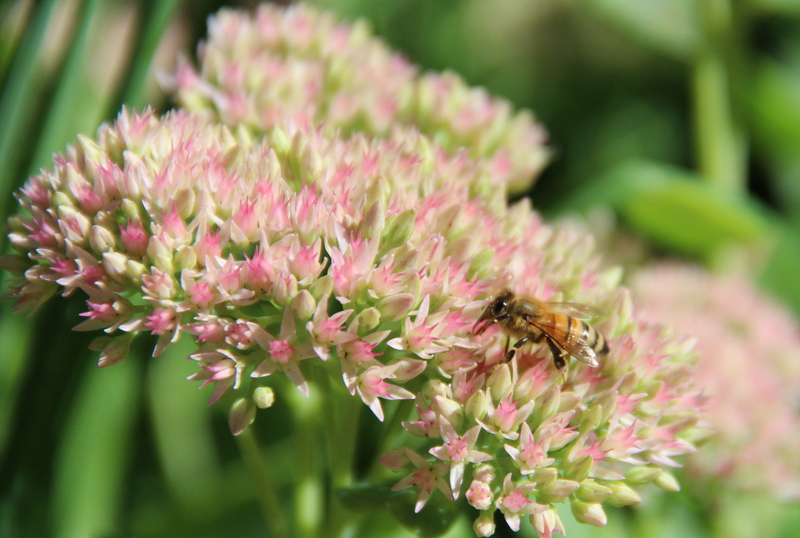 Honeybee (Apis melifera) collecting nectar and pollen from sedum ‘autumn joy’. It wasn’t until I was an adult and a gardener that I grew to like bees — especially bumble bees. Why bumble bees? It comes down to temperament. Bumble bees are large, round, fuzzy, noisy and very intent on collecting nectar. Their sting packs a wallop, but bumble bees are even-tempered and rarely sting unless they feel threatened. Many times I’ve accidentally knocked a bumbler out of a flower; the bee ignored me, flew back into the flower and resumed pollination. Once, a neighbor was cutting back old hosta stems, squeezed the faded blossoms in the process, and was stung by a bumble bee that was deep inside of a blossom. In decades of gardening, that is the only time she’s been stung by a bumble bee. 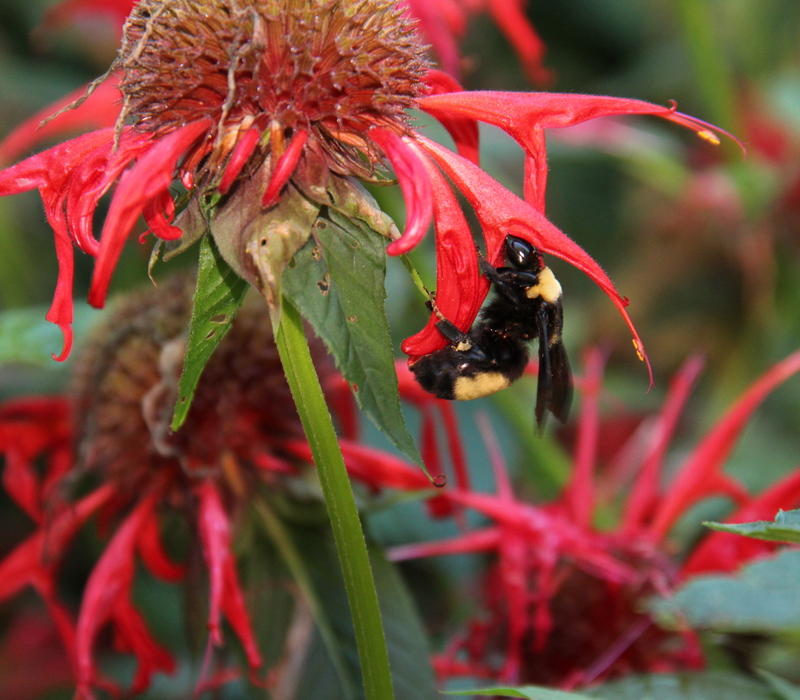 A black-and-gold bumble bee (Bombus auricomus) nectars in monarda ‘Jacob Cline’. 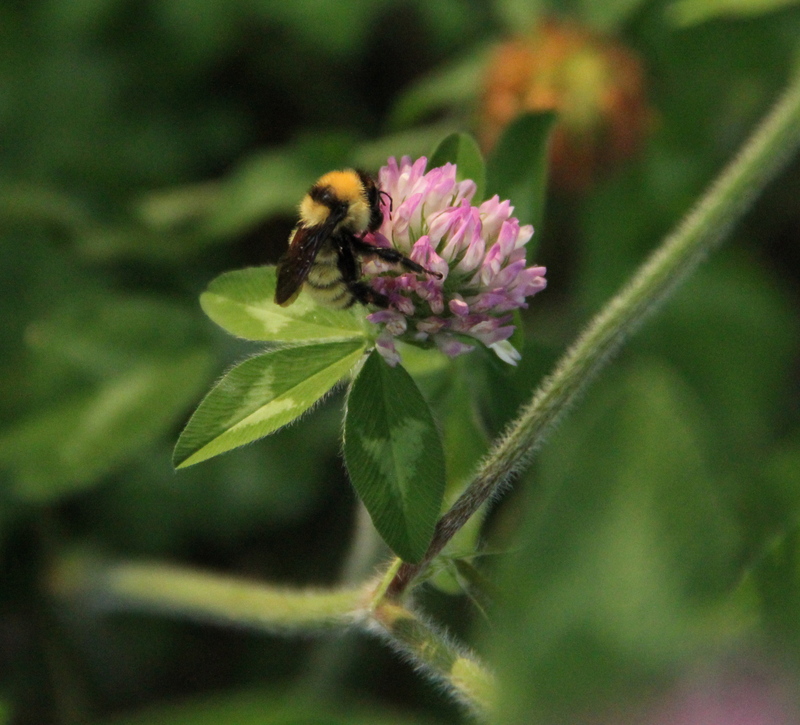 A boreal bumble bee (Bombus borealis) rests on red clover (Trifolium pretense). Common eastern bumble bee (Bombus impatiens) on Veronica ‘Red Fox’. Bumble bees are native to North America, unlike honey bees, which were brought to the United States from Europe. Covered with thick, soft hair, bumble bees vibrate their strong flight muscles to raise their body temperature and fly at colder temperatures than other bees; as low as 41˚F (5˚C) in comparison to about 57˚F (14˚C) for honey bees. They pollinate flowers and crops both earlier and later in the season than most species. I love the sound of their buzzing in the autumn garden, which is much quieter now than the busy insect-filled garden of just two weeks ago. The bumble bees will fly until early November if the weather stays mild. Then, only the young queen bees will overwinter to create new colonies next spring. I miss all of the bee activity during the winter and look forward to seeing a queen bumble bee collect pollen and nectar in the first crocus next April. 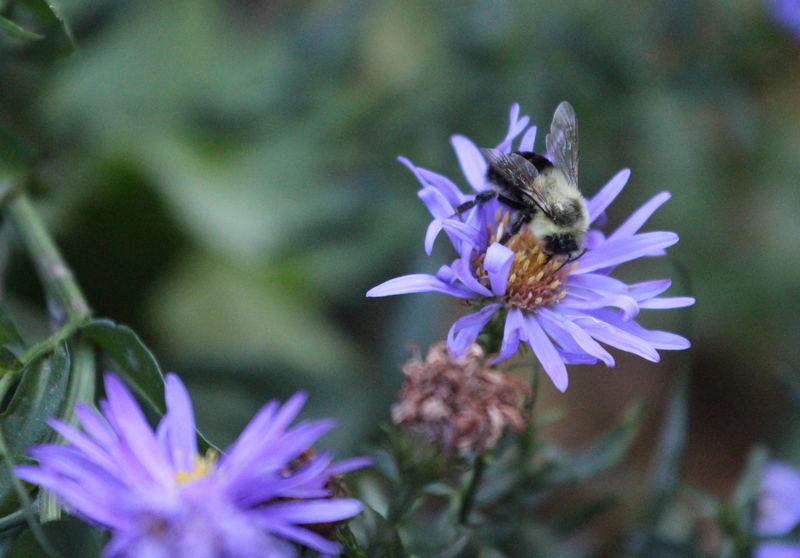 Common eastern bumble bees are active in autumn, even on cloudy, cool days. 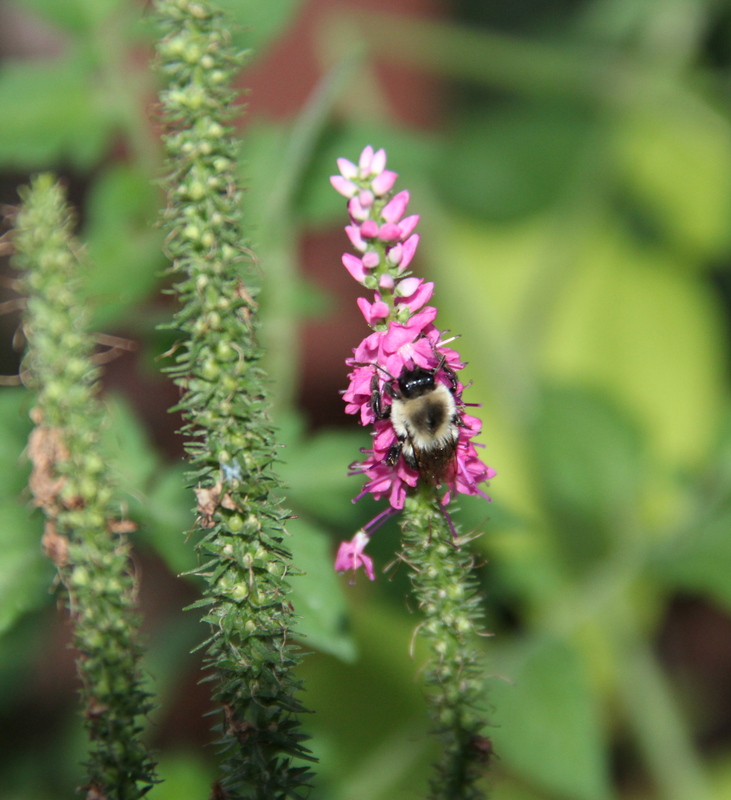 This entry was posted in Bumblebees, Insects, Nature Photography, Saint Paul, MN and tagged Bees, Bombus, bumblebees. Bookmark the permalink.